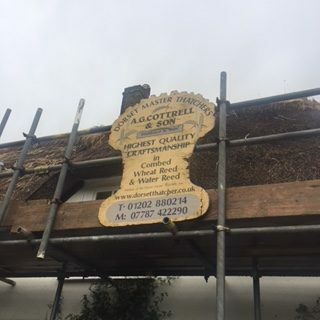 Blog Stories Gal on a Cold Thatched Roof! 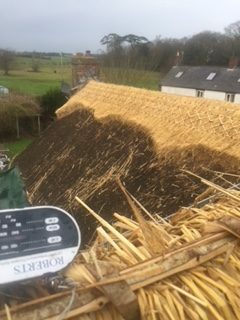 Gal on a Cold Thatched Roof! 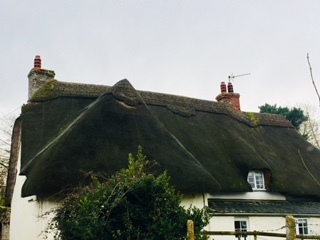 Dorset England is home to 12% of thatched-roof houses in England, a fairly significant concentration, so on my holiday road-trip around the UK, I bee-lined south-west. 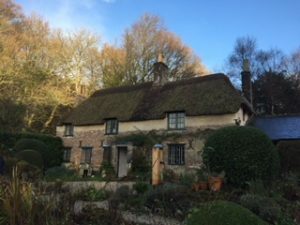 As a long-time enthusiast of British vernacular architecture, I’d devoured multiple books and articles on the subject but had never been up-close to a real thatched roof (dorky, I know). I planned to take lots of pictures, perhaps stay in one or two and call it done… Little did I suspect what awesomeness awaited me. Langton Arms, Tarranton Monkton, Dorset. 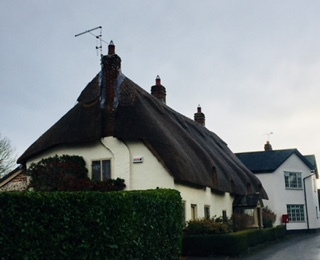 car, I exhausted myself and sought out a thatched roofed inn I’d seen on the internet. It was miles deep into the country, and surprisingly hidden, and incredibly dark by the time I arrived. Getting to it actually took fjording (see video) a fast running creek in my untested rental car of a make and model I’d never before heard. Instead, I went the long way around. 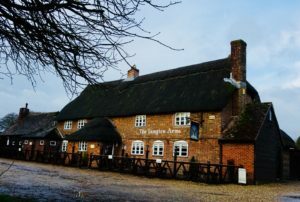 I found the inn –called Langton Arms– nestled in a tiny village by the name of Tarrant Monkton. Exasperated, a little hoarse, and worried there’d be no rooms, I wandered into the pub portion of the inn and found myself surrounded by a half-dozen father-aged men in pheasant hunting garb pleasantly downing ales and talking in a thick accent. I begged a room, answered the gents’ friendly questions about my origin and ‘how the hell I found that place of all places’, told them my new-found fear of Lorry Drivers (truck drivers there skirt past too close and too fast, with abandon) and settled into my room. He called over to artsy looking fellow — pretty much exactly what I’d imagine a thatcher to look like, with a twizzly mustache and goatee and a neckerchief tied in a knot around his neck, a newsboy cap on his head. My companion said, “Tony, this young lady is interested in thatching, you should come answer her questions.” Tony came over and shook my hand and said, “Oh you have questions do you?” He sat down next to me and answered myriad questions and told me his life story — London Advertising Executive gives up 1970’s rat-race, moves family to Dorset and becomes Thatcher/Artist. So pretty much, this is the English version of Mad Men’s “Don Draper” AFTER he comes back down to earth, AWESOME. He has a kind face and a dashing wit and puts on the Dorset dialect for my benefit, which I can only compare to that which I’ve heard in Thomas Hardy flicks via “Masterpiece Theater” but here’s a clip of poet William Barnes for your entertainment: Dorset Accent. He insists on buying me a glass of his favorite Scotch whiskey (they don’t call it Scotch there, btw) and brightens up when the idea of inviting me down to his work site the next morning, hits him. “We’re just working down the road, cross the ford and turn left at the main road, it’s just right there.” “You drive across that creek, really..real-ly?” I exclaim in complete awe. “Aw, sure, it’s safe!” the WHOLE pub assures me. Author Thomas Hardy’s Home, Dorset. The next morning I hurriedly scarf my meal, taking two pieces of buttered toast and a few pieces of bacon and making a sandwich that I roll in a napkin. A drunken compatriot of Tony’s has told me that I should bring Tony a “bacon sandwich”. I roll up to the job site, a little nervous. I’m suspect that my pocket-full of bread and bacon will be appreciated, but I proffer it to him anyway and he’s surprised and laughs and sets it on the dash of his truck. It seems to break the ice. They’re happy to see me regardless of my paltry offerings. Tony introduces me to his son Mark and another worker. Then he walks me over to a grouping of bales of straw, wheaty-seed pods intact. He tells me about the various straw they use, especially grown for them because of it’s unusual height or length. Various regions use differing straws or water reeds based on what was available locally and what works best for the local climate. 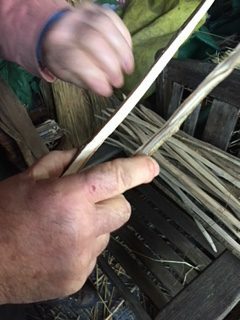 He also shows me the hazel sticks they use, sharpened at each end and twisted and bent into staple or hair-pin shape and officially called “spars”. He gives me one to keep, and some straw too! He then points to the two layers of scaffolding and asks me if I’m afraid of heights. My eyes open wide and I ask if he’s actually going to let me go up there and he of course says yes!! 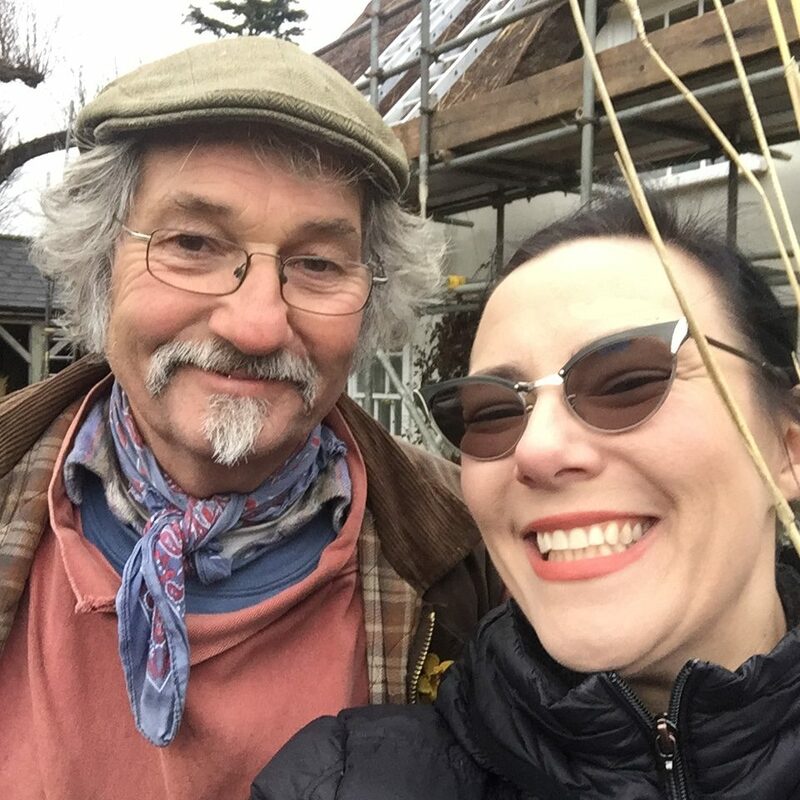 He teaches me the best way to climb the ladder and step onto scaffolding and we go up, where he then shows me another ladder going up to the ridge line of the roof and points to that. 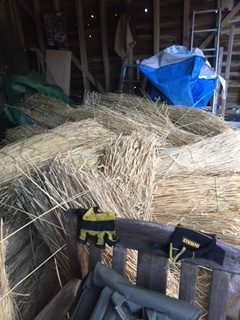 “We’re going ALL THE WAY UP?” But not before he stops to show me the old thatch layer, which is, with exception to the very ends, as sturdy in strength as the new stuff they’ll put on. We climb up to the tippy-top of the roof where Tony’s son Mark is already standing and pounding spars into the ridge. 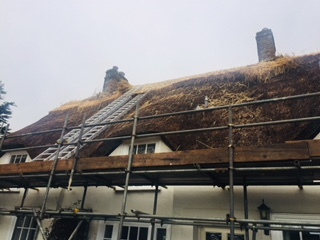 They’re completing a new ridge which takes the brunt of the weather and need to be changed out more often, where as the some of the thatch underneath can be original. The explain to me the leading or ‘flashing’ as we call it and how it can be concrete but actual lead is preferable. I’m eating it up (well, not literally because lead is bad for you). 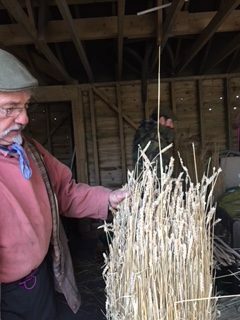 They show me the different styles of ridge-work, one that bends the reeds/straw over the ridge or one where two reeds meet, and how they batten it down with an artistic trim of hazel that can best be described and needlepoint or cross stitch, only in hazel! They explain that they hand trim the decorative curves into varying patterns and how Tony has introduced several new designs into the area beyond the traditional clover, etc, just for variation. I will later drive the neighborhood looking for his work. 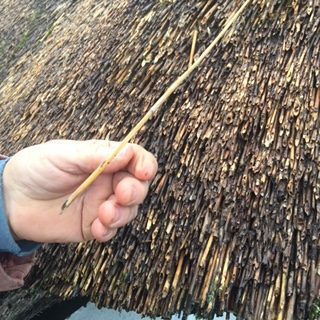 They also create the roundness of the roof by trimming the thatch by hand with a blade. The idea makes my mind spin, and I decide if I ever quit selling real estate I want to be a Thatcher (but not Margaret). 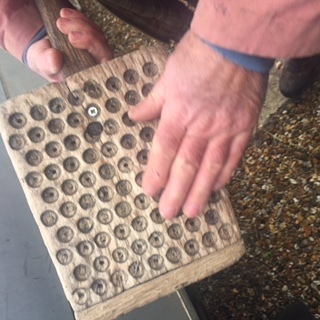 Off the ladders and back on the ground, Tony breaks out the tools of his trade to show me, many of which he’s made by hand out of English oak. 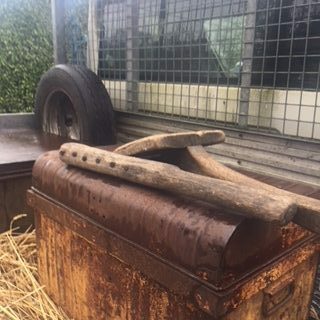 Some of which are historic relics passed down to him by his predecessors and still hardy enough to use today. They all have a purpose and though modern versions can be purchased, he prefers the original ones. 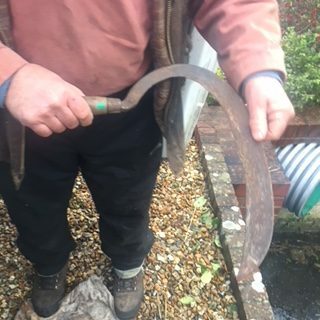 He’s put several handles on that scythe-shaped piece. He’s a traditionalist and prefers that approach even when it comes down to substrate. 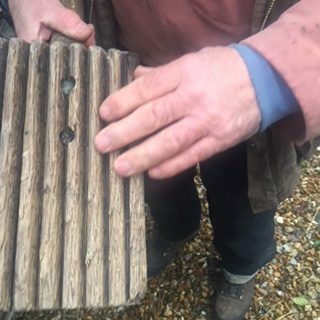 No modern nailing into wood lathes for him, it’s all tamped down with hazel spars and steel reed pins. 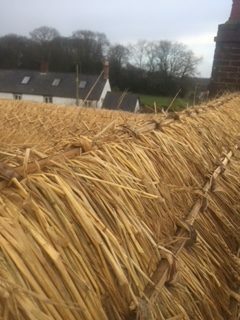 Since thatching has been used as a roofing option from the bronze age, I’m more interested in traditional methods that modern ones. I’ve met the right kind of thatchers for my taste, I ‘ave! (Pretend I said that in a Dorset accent). As we finish, I egg him into taking a few cheesey pictures together and I can’t help but hug him, as this is one of those experiences of a life-time and I am over the moon in my nerdy way. 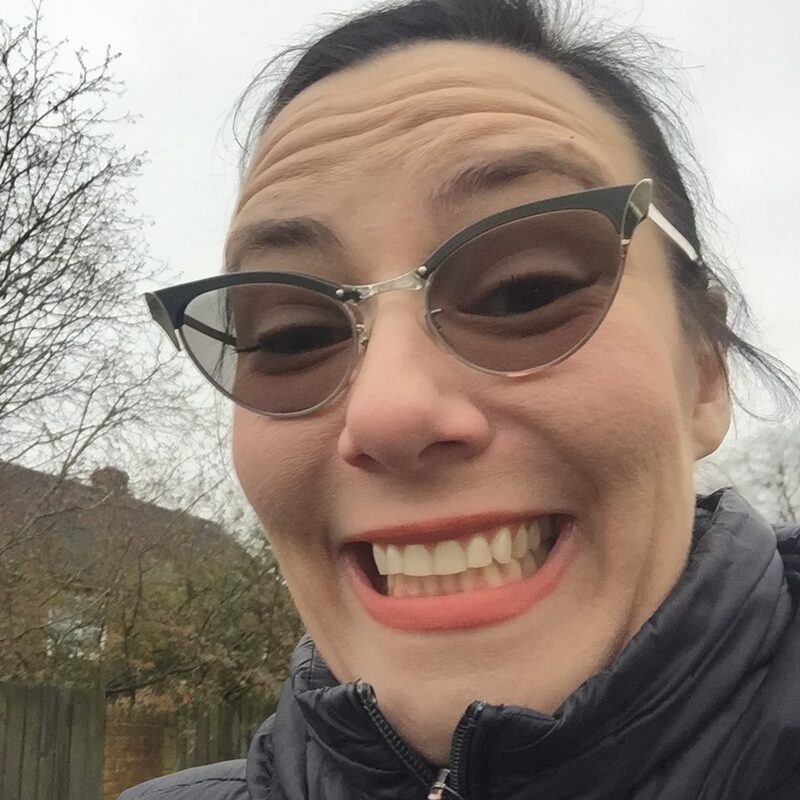 My geeked-out smile attests to the sheer joy and appreciation I am feeling. I am the gal who went to England and met a Thatcher — Gal on a Cold Thatched Roof. Tony the Dorset Thatcher and a very pleased Alyssa. 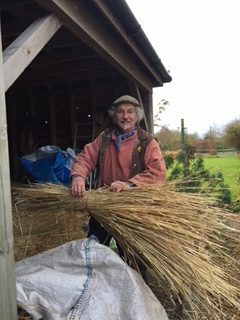 Tony and a bundle of wheat straw. Wheat Straw especially grown for height. Bending hazel into a spar. The scaffolding and ladders I would soon climb! Up on the roof, the replaced ridgeline. Close up of the ridge. Older reeds still as robust as when new. 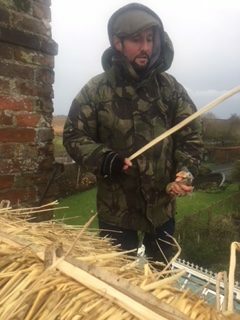 Thatching Leggett for Water Reed. 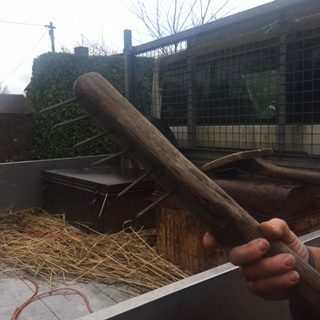 Side Rake for long straw. 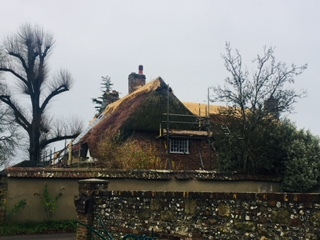 An example of Dorset Thatching.